Cyberlink has released PowerDirector 14 Ultimate with some new fun features that will add more colors to your video editing productions. Some of the features added are 4K editing and motion tracking which can help you create videos like the other competing video editing software out there. Cyberlink PowerDirector is available as a 30-day trial for download at its official website which adds their watermark when you export your video. You can try it and see whether it is the one you need. One of the coolest things I like about PowerDirector is that it is easy to use and even a beginner in video editing business can understand the interface and get started. This can be a starting point of your editing journey. So, let's dive straight into the features of this amazing video editing software. The following are the features of Cyberlink PowerDirector 14 Ultimate. One of the coolest features of PowerDirector is an option called Express Project. You can get into this mode when you start the application. You just have to select the images and videos to be used in your final video, select a template and do some customization according to your interest and PowerDirector will do the next steps for you. It will create and render a movie right away with the contents you provided. You can download more templates from directorzone.com. Screen recording is one of the important things for many today. You can use PowerDirector to record your screen and in this way create gameplay videos or instructional videos and upload them online. Most of the time you have to buy a separate software just for screen recording, but now PowerDirector has it all in one package. The world of technology is attaining giant leaps when it comes to resolution every now and then. Now in the age of 4K, it is necessary that you have the capability to work with 4K videos in your editing tool. PowerDirector helps you out in this. It works well when you import and start editing your 4K videos though sometimes it may slow up the preview speed of the edited video. PowerDirector also has the capability to edit and create 3D videos which when rendered you can watch using 3D glasses. There are also effects and transitions for 3D videos which will seamlessly work with 3D videos. There is also an option of converting any video you have to 3D which works considerably fine. The interface of PowerDirector is simple and easy to understand. You won't have much trouble getting around with the software if you have a basic understanding about video editing. Now they have included the capability to add transitions in between a video clip which is pretty useful in some situations. There are buttons to show just the videos, photos, audios separately which is helpful when you have a lot of content of different type. Multicam editing is a feature which is really important to you if you have a video footage of a live program or a show with different angles. It becomes difficult to edit such type of content with normal editing techniques. So, multicam editing can help you save a lot of time by just importing all the media into PowerDirector. The videos get synced with the audio and now the only thing you have to do is the select the angle that you want to have in the final edit. You can also import a separate audio track to go along with the video. Motion tracking is the ability to track a certain object in the video and display text or other video or images according to the motion of the object. It helps you create amazing videos especially in case of titles. You can add titles to an object in the video and as the camera moves, the title moves along with the object it has been aligned to. You can get at the top of your creativity by using this feature. Action Camera Tools contain some tools which can fix the problems occurred with the camera. They can fix issues like fish-eye distortion, camera shake, color etc. There are also other effects like replay, slow motion, reverse and more. These tools can bring about a dramatic change in your final video. There are many features other than the above mentioned ones like stabilizing video shakes, fixing the color of the video, changing the speed of the video, sharpening, white balance, brightness, contrast, hue, saturation and much more. 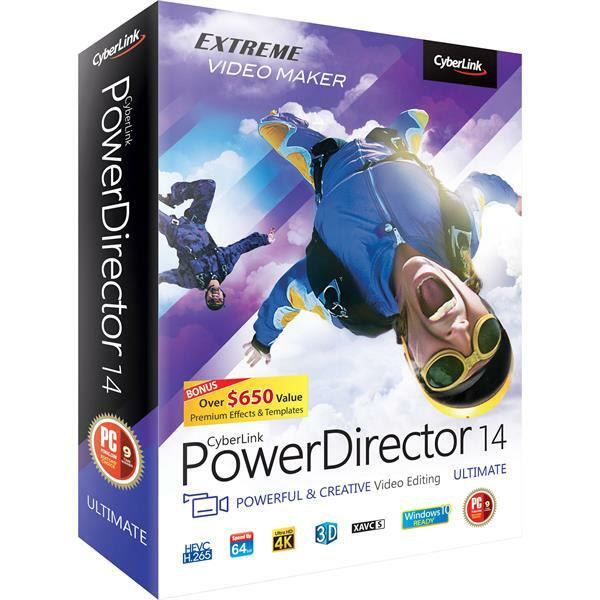 If you are a beginner and are looking for a video editing software that you can use to create some amazing videos with less time, you should definitely check out Cyberlink PowerDirector 14 Ultimate. It costs around $99. So, it is not as expensive as many other high end video editing software. You can get started by using this software.